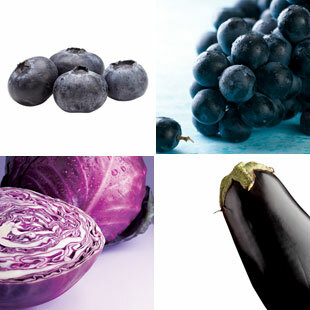 Tip 1: Eat These 6 Purple Foods to Help Your Blood Pressure. Research shows that people who eat blue and purple fruits and vegetables—blueberries, plums, purple cabbage, black currants, eggplant and purple grapes—have a reduced risk for high blood pressure and low HDL cholesterol (that’s the good kind). Scientists believe that anthocyanins, the compounds that give purple foods their color, are responsible for these boons. Blue and purple foods make up only about 3 percent of the average American’s fruit and veggie intake, so aim to eat more. For more Healthy Hearts Challenge tips, meal plans and recipes, visit the Healthy Hearts Challenge landing page.